The group of New World primates known as “saki monkeys” has had loose characterization at best. The genus Pithecia – which means beard in the local language – was first identified two-hundred years ago. Naturalists were inspired by the “bearded” appearance many associated with the species (though modern investigations have proven that some of these original “bearded monkeys” are not, in fact, Pithecia). Now primatologists have re-analyzed the collection of descriptions, living and preserved specimens to better delineate the sakis’ family tree. After some rearranging, reinstating, and reclassification of the monkeys, researchers realized there were FIVE novel species of saki of the sixteen recognized members: the Ryland’s bold-faced saki (Pithecia rylandsi), the Mittermeier’s Tapajos Saki (Pithecia mittermeieri), the Isabel’s Saki (Pithecia isabela), the Cazuza’s saki (Pithecia cazuzai), and the Pissinatti’s bald-faced saki (Pithecia pissinattii). 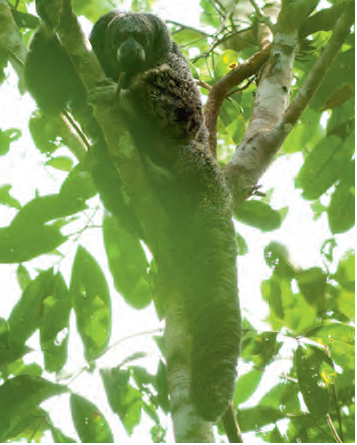 The one new species The Good News Review would like to highlight is Isabel’s Saki (Pithecia isabela). Every new saki’s name has a story but this one is particularly inspiring. The species is named after Isabel Godin des Odonais, a Spanish colonial aristocrat living in Peru. After being apart from her husband, Jean Godin, for twenty years due to an expedition gone awry and colonial politics, Isabel had enough. She set out to rejoin her husband in French Guiana, planning to cross the Andes and part of Amazonian Basin. She began her journey with 42 in her company but eventually the was left the only survivor. After twenty-eight days fending for herself in the jungle she was found and nursed to health my missionaries. Using their connections, Isabel was finally reunited with her husband. Find out more about the new and returning saki species at Sci-News which also hosts the original paper published in Neotropical Primates.